Electronic projects including building robots, automation and modifications. To get my Raspberry Pi robot moving, I need a wireless robot control system. So, in this article, I connect a game controller to the Raspberry Pi and use Python programming to manage the input commands. Included, is a controller button-ID map and Python base-code to translate controller inputs. 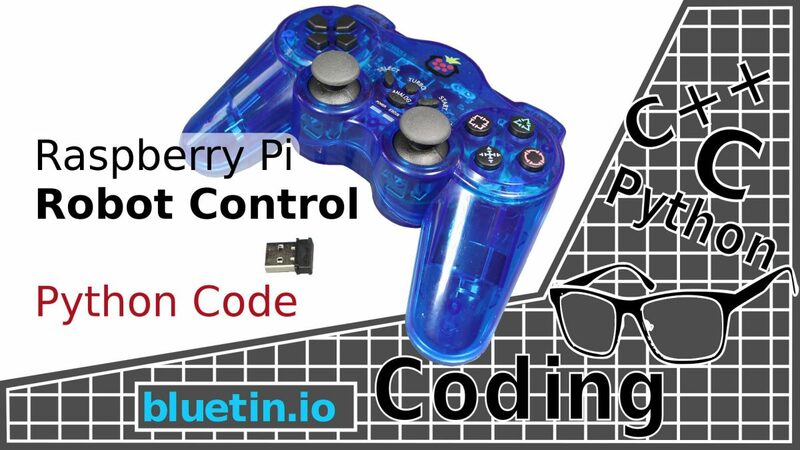 For this exercise, I will be using the Raspberry Pi controller, see the review here. However, this exercise should work with any controller that is supported by the Inputs Python module. It should be noted that game controllers are only suitable for short-range wireless robot control. Robot Control – Raspberry Pi Controller Button Map for Python Inputs Module. At first, it might seem a bit overkill to use a game controller for controlling a robot. This is due to the number of buttons available. However, some game controllers, like the one I use here, is plug and play. Which, will help reduce overall setup and simplify Python code. Over time, it is likely that more buttons will be used as more control features are added to the robot. The goal is to create a parcel of code that just deals with the robot control system. So, the control system will be responsible for collecting inputs from the controller. Then format and filter those inputs to execute specific functions. Drive and steer robot control algorithm. Control LEDs for various lighting systems such as Headlights, turning indicators, beacons and decorative displays. Add a control to various robot attachments such as a Nerf dart gun and camera pan and tilt. Switching various systems on and off. Add autonomous control elements to wireless robot control. The robot control Python code below provides a good starting point in developing software to control a robot. If you are using a Raspberry Pi controller, such as the one featured in this article, you can run the code now on a Raspberry Pi. The code, in its current form, does not yet drive any Raspberry Pi GPIO pins or DC motors. However, that will change over the next few articles. # Dictionary of game controller buttons we want to include. # Code execution stops at the following line until gamepad event occurs.
""" Main entry point of the app """
""" This is executed when run from the command line """
The above code can easily be modified to catch all the game controller button events. Furthermore, the code, with the featured game controller, will also work on a Raspberry Pi Desktop virtual machine. Thus the article to set up a Raspbian virtual machine can be found here. I am writing the robot control code to support Python version 3 and above. So the suitability of the code for other Python versions will not be tested here. However, most Raspberry Pi OS versions will likely have Python3 already installed. If you are working within an isolated Python environment, you will need to install the inputs module there. There is a guide to isolated Python environment setup here. Ideally, you want the above Python code in a suitable directory. So change to a directory to run and edit the code from. Then, either copy the above code to a new file or download the code from my Github. However, make sure the controller wireless dongle is plugged into the USB port before running the code. Moreover, the code may not show any output initially, at least until you press a controller button. Dictionary key names and event.code values are the button labels in the controller button map image displayed above. So, the above code snippet is using the dictionary data type to register controller buttons I want to use. Using the dictionary data type allows me to associate dictionary keys to controller event codes. Thus I can avoid using loops in the code for value matching. The function above deals with collecting button presses from the game controller. So the code reads all the events that are triggered while using the controller. Then for each event-code read, we check if the event-code matches a key name in the dictionary. And if there is an event-code match, the dictionary key value will update with the event-state value. The value of 0 or 1 for button inputs. Where value 1 means the button is active. For the Hat pad, 0, 1 and -1, will output for different states. 0 to 255 for thumbsticks input, with resting position values of 127 and 128. 0 to 255 for Gas and Brake trigger buttons. The above functions are basically to test that the controller buttons events have filtered through the program correctly. furthermore, you can create new functions with code that interacts with the Raspberry Pi hardware. For instance, press a controller button to turn on an LED. The print statements in the above functions are there just to provide feedback to the terminal screen. But you can remove or change these. Apart from importing the gamepad library from the inputs module, no game controller set up is needed. So we just call the gamepad update function on every program cycle. On a successful controller event match, the matching dictionary key is updated. Then the dictionary key name is returned when the function call has ended. Therefore, in the main function, the returned key name is then filtered through if statements. However, any controller buttons added to the dictionary should also be added to the if statement tests. Successful if statement tests can then lead to a function call to perform some kind of action. The above call from the gamepad update function is an execution blocking function. This means the robot control program will stop at this line of code while it waits for another event. Therefore, the robot control program, in the current form, cannot continue another process if there are no gamepad input events. However, the blocking function is not a deal breaker, as there are easy enough ways to get around it. But for general switching on and off functions and PWM adjustments, the above code is fine. The next step, to develop this code further, is to add DC motor control. So the next article we will look at functions to make a robot drive in all directions. Multithreading Raspberry Pi Game Controller in Python – Link. Raspberry Pi Controller For Robot Control Review – Link. Raspberry Pi Raspbian Virtual Machine On Your Desktop – Link. The purchase price is going to vary greatly depending on how quickly you want the items. Therefore shop around checking out Amazon, Ebay, Adafruit and local electronic stores. I hope you find this article useful – Robot Control with Raspberry Pi and Python, please like and share.